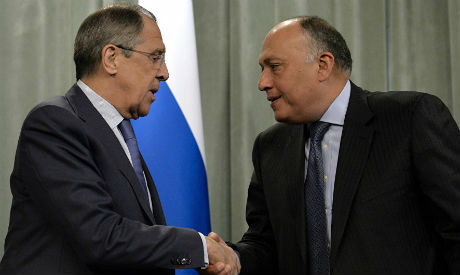 Egypt's Foreign Minister Sameh Shoukry and his Russian counterpart Sergei Lavrov discussed in a phone call on Monday various bilateral and regional issues. In an official statement, Egypt's foreign ministry spokesman Ahmed Hafez said that Shoukry and Lavrov discussed how to reach a political resolution to the deadlock in Syria in a way that safeguards the unity and sovereignty of the Syrian state. The two FMs also agreed on the importance of continued support for a comprehensive and fair solution to the Israeli-Palestinian conflict based on the two-state solution, which is a main pillar to achieving peace and security in the region. Shoukry and Lavrov also discussed bilateral ties and cooperation in all fields between the two countries in the upcoming period.